Tyler Peterson won two individual events Thursday to lead Centennial’s boys swim team to a 188-63 win over Desert Oasis at Pavilion. Peterson won the 500-yard freestyle in 5 minutes, 17.18 seconds, and took the 100 backstroke in 1:03.07. Kyle Paronto won the 200 individual medley (2:30.81) and was second in the 50 freestyle for the Bulldogs. Desert Oasis’ Michael Finetti won the 200 freestyle (1:56.62) and 100 butterfly (1:02.03). Del Sol 129, Durango 27 — At Pavilion, the Dragons won every individual event but one as they routed the Trailblazers. Del Sol’s Gregory Holt won the 100 backstroke in 1:20.63, nearly 45 seconds better than the next-best swimmer. Michael Vece won the 100 freestyle (1:07.83) for Durango. Arbor View 225, Cimarron-Memorial 27 — At Pavilion, the Aggies swept every event to cruise to an easy victory over the Spartans. Junior Everett Rojas won the 200 individual medley (2:08.14) and 200 freestyle (51.83) to lead Arbor View. 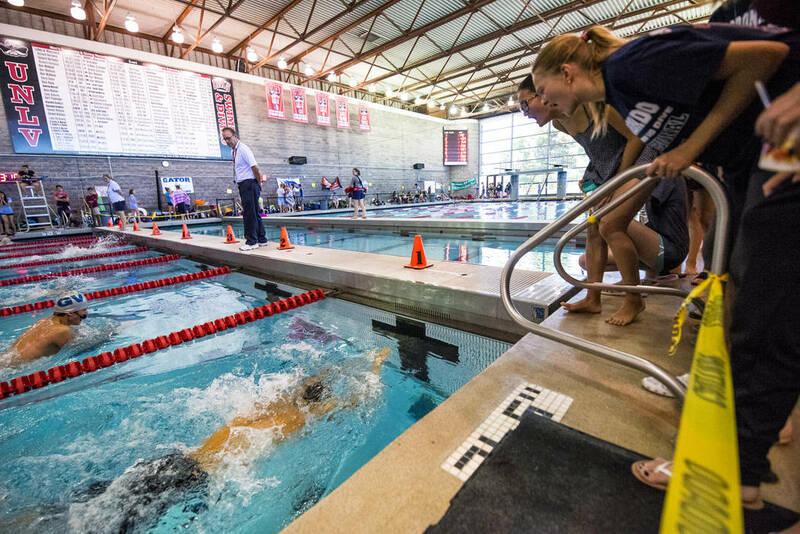 Legacy 206, Bonanza 39 — At Pavilion, Andrew Mason, McKay Mickelson and Tama Tuitama each won two individual events to lead the Longhorns past the Bengals. Mason was first in the 500 freestyle in a time of 5:14.14 and also won the 100 backstroke in 1:03.45. Mickelson won the 200 individual medley (2:04.41) and 100 breaststroke (1:08.19), and Tuitama posted victories in the 100 freestyle (48.47) and 200 freestyle (1:47.69). Durango 145, Del Sol 102 — At Pavilion, Alyssa DeLuna won the 100 butterfly (1:10.25) and 500 freestyle (6:14.53) to power the Trailblazers over the Dragons. Arbor View 211, Cimarron-Memorial 61 — At Pavilion, sophomore Isabella Jones won a pair of events to lead the Aggies to win over the Spartans. Jones placed first in the 100 freestyle (59.83) and 100 backstroke (1:09.64). Senior Amina Bachir won the 500 freestyle (5:24.43) for Cimarron. Legacy 145, Bonanza 121 — At Pavilion, Isabella Schutte won two individual events, helping the Longhorns edge the Bengals. Schutte touched first in the 100 butterfly (1:03.70) and the 500 freestyle (5:41.75). Joelle Beachler and Alyssa Hawkins each won one event and finished second in another for Legacy. Desert Oasis 149, Centennial 136 — At Pavilion, Charlotte Randolph and Ayanah Cason each won two events as the Diamondbacks defeated the Bulldogs. Randolph won the 200 freestyle (2:02.7) and 100 butterfly (1:11.41), and Cason was first in the 100 breaststroke (1:09.69) and 200 individual medley (2:17.08). Meg Kurosawa won the 50 freestyle (26.24) and was second in the 100 freestyle for Desert Oasis, and Alexie Johnston won the 100 freestyle (56.78) and was second in the 50 freestyle for the Diamondbacks.